Welcome to the Learning by Design Project website. This site is a resource for participants in the Learning by Design project, or for those who want to find out more about the project. A good starting point is to have a look at the wonderful work teachers have created published in the Scholar Bookstore in English and in Greek. If you like what you see and want to start immediately with Learning by Design, or if you prefer learning-by-doing to a more theoretical starting point, take the Quick Start path. 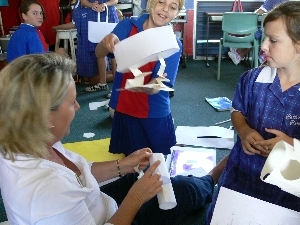 But the story of Learning by Design really begins with a conceptualisation of The New School — a place where learners are actively engaged as knowledge producers and in which teachers have assumed a transformed professional role as designers of hybrid online and face-to-face learning environments. This leads us to articulate the guiding Principles in the Learning by Design project, situating ‘pedagogy’ in the contexts of ‘curriculum’ and ‘education’. From here, we explore the Pedagogy of Learning by Design, and the ways in which it represents an inclusive approach to Learner Diversity, by building into curriculum the idea that not every learner will bring the same lifeworld experiences and interests to learning, and creating pedagogical scaffolds which do not assume that every learner has to be on the same page at the same time. We also introduce the idea of Multimodality, in which learners move between written, oral, visual, audio, tactile, gestural and spatial modes of meaning-making. The next part of the website is practical and goes into more detail about how to implement Learning by Design. There is a guide to Getting Started, including supplementary resources. We describe an optional Placemat activity in which teachers may choose to draft their learning design ideas on paper before transferring them online. This is followed by an introduction to the online Learning Module and a collection of possible learner activities, sorted under the Learning by Design Knowledge Processes. We then discuss strategies for Assessment of student performance using the Learning by Design approach. The final links are practical—a listing of References, a Glossary, some background information About Learning by Design, an introduction to the R&D Project which we are currently undertaking and Contact details if you would like to become involved in the project. We also have a mirror site in Greek for a project we are undertaking with the Greek Ministry of Education. This project is supported by a grant to Common Ground Publishing by the Institute of Education Sciences, U.S. Department of Education under the Small Business and Innovation Research (SBIR) Program. As a part of this project, a team at the University of Illinois undertook research into classroom implementations of Learning by Design, led by Denice Ward Hood, William Cope and Mary Kalantzis.